From imaging to putting on displays at the Super Bowl, drones have seen plenty of action. Now one team at the South Dakota School of Mines and Technology hopes to allow them to think and operate on their own. 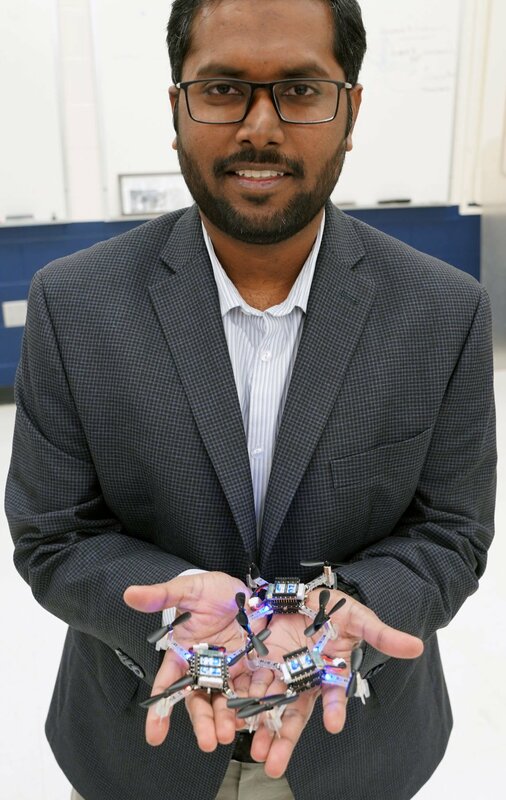 Dr. Shankarachary Ragi, a professor at the South Dakota School of Mines and Technology, shows off his teams test drones. Ever since drones became mainstream, researchers and enthusiasts alike have been applying the unmanned aerial vehicles (UAVs) to all manners of practical applications. Dr. Shankarachary Ragi, an assistant professor in the electrical and computer engineering department, heads the group and has applied his research into machine autonomy toward this new project. At its core, Ragi hopes to use swarms of hummingbird-sized drones to traverse and map fields for everything from precision agriculture to military topography. “It’s primarily about developing methods to let hundreds of drones work together to achieve tasks,” Ragi said. Three graduate students are working with him to perfect algorithms and machine code to allow the drones to operate independently but also as a cohesive unit. “It’s not an easy problem, but it can be solved,” he said. In precision agriculture, Ragi sees his swarm project as a gateway to allow drones to do tasks that currently require manpower and a large allotment of time. At a very basic level, the swarm of hummingbird drones would allow for accurate mapping and sensor data. Each drone would carry a specific set of sensors or cameras to allow for different imaging in the field. “The drones can form a shape to cover the maximum distance possible,” Ragi said. Once an algorithm is in place to allow the swarm to work together, but think independently, Ragi said that technique could be applied to any number of applications. For instance, the swarm could be equipped with drones designed to spray and spread fertilizer to maximize yields in the field. “Drones could create a uniformed state across the field,” he said. Ragi has plans to meet with Raven Industries to discuss a partnership with the company, which specializes in precision agriculture and spray equipment. Spraying fertilizer and analyzing fields isn’t the goal for his project, Ragi said, but it’s on his mind. The technology, once tested, could be applied to many different fields and operations. “If you can develop something that sprays fertilizer, picking weeds isn’t that far off,” he said. While Ragi said the core idea shouldn’t be hard to implement, he is worried that the swarm will think too slowly for practical applications. That is what he and his team have been working to perfect. He hopes by the end of the year there will be a system in place to allow the swarm to operate autonomously. Each drone would map and coordinate without having to respond to a centralized computer. If one drone were to fail and fall out of alignment, another would take its place and continue on with the task at hand, Ragi said. The School of Mines team has been working with small drones to cut down on costs. Each one costs around $30, allowing for easy replacement and for each drone to carry a small camera or sensors. The final test of the fleet will be telling the drones to fly 10 meters up and form specific shapes in the air. By completing that task, Ragi said he will know the swarm is acting quickly and autonomously while working together. — Contact Jager Robinson at jager.robinson@lee.net.